Bi-fold doors, or folding doors, are typically interior doors. These folding doors, however, are exterior doors and made of metal. The door has three sections and each section has five equally-spaced, raised panels. The door has been finished in an of-white enamel, though the door's finish has been compromised in several places. Interestingly, a mail slot has been installed in the rail of the left-most section of the door. As this is a folding door, each section has its own bottom rail. Above the door is a window with three horizontal bars, perhaps for added security. Some kind of locking mechanism has also been added to the door. 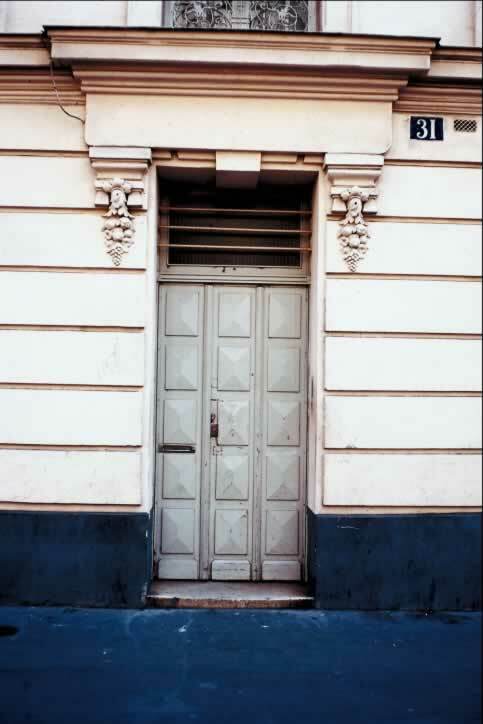 The door does not appear to be original to this building as some of the other design elements, and the finish, are very different from each other.